There was an article in the August issue of Food and Wine (Farm-Fresh French Recipes) with several great-looking recipes I intended to try. Among those recipes were chilled zucchini soup with purslane, brown rice pilaf with green olives and lemon, oven-roasted tomatoes stuffed with goat cheese, and basil limeade slushies. Unfortunately, I was having the kind of day during which everything that could go wrong did. I had brought home some heirloom tomatoes that were real beauties, and I had procured some goat cheese, and my own basil plants are still going strong. I made the goat cheese stuffing, placed it in the tomatoes, and roasted them. No problems there. However, when I reached into the oven to remove the baking dish, it slipped out of my hands, and the tomatoes and goat cheese stuffing landed upside down and smooshed all over the oven door and the floor. By some miracle, the dish didn’t break, but brunch was ruined. Later that night, I had much better luck with these slushies before dinner. As for the name, I previously made watermelon margarita ‘slushes’ while these are named ‘slushies.’ Tomayto tomahto. I’ve just gone with the name that was printed with each recipe. There’s a note at the beginning of the recipe stating that by adding rum these would make great cocktails. So, of course, especially after my unfortunate morning, I made them into rum cocktails. Ice, water, lime juice, basil leaves, sugar, and rum were blended. That mixture was poured into glasses and was topped with sparkling water. I actually used a bit less sugar than suggested which made our slushies nice and tart. The basil and lime together was a delicious combination that mixed very well with rum. I was certain this would be a concoction that only I would enjoy, but Kurt actually gave it a big thumbs-up. Regardless of how your day is going, these slushies would be a nice part of it, and I’m sure they’d be just as good even if you left out the rum. how frothy and completely delightful! 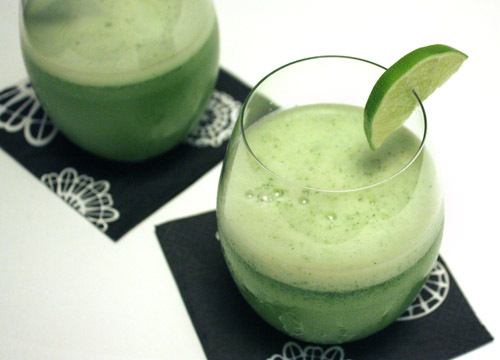 lime has become a favorite flavor of mine, and this is yet another fine way to enjoy it! Beautiful, a must make for St. Pats. There is a great lounge in San Fran that makes these cocktails in the non-slushy form. They're so refreshing! YUM! I LOVE lime so much that I put it in just about every cocktail that I drink. I also love basil, but can't imagine it in a cocktail. I'm going to have to try this slushie! I have about three past issue of F&W that are in a stack waiting to be read! Amazing, great flavor. Love the color. I have a girls night coming up, these might be just right. Amazing flavors and gorgeous color! Very nice! These are some grown-up slushies that one definitely cannot get at a 7-Eleven. I love the vivid green color. And I bet they go down ever so smoothly. Atta Girl! When life throws you a few curves... get creative with rum. I knew I liked you, LOL! I'm basically a klutz, so I have many days like that & have learned to roll with the punches, so to speak. The slushies look absolutely devine. So vibrant, so refreshing, and so delicious looking! I've been loving basil in sweeter applications (made mojitos with basil and orange not long ago), and this looks like another winner. What a great color!! this looks great and refreshing! discoved your site via noobcook..good thing we did! Slushies/slushes...it looks so fresh with its beautiful and bright green colour! sorry about those suffed tomaotes..they sounded good too...another time? wow!! soo refreshing!! ive never tried this before!1 sound delish! 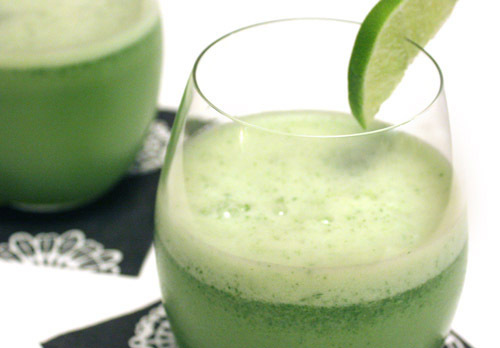 these sound so refreshing - I need to get in on this basil beverage craze. I have not thought Basil can be used in a drink but why not ? I feel thirty now already. Perfect for the summer! I've never had basil in slushy before and now I am curious about it. Too bad about the tomatoes and goat cheese stuffing, but these things happen. Something similar happened to me recently too, it's no fun! I'll take one with rum please :) What a refreshing and tasty drink!